19th October 2015 was election day in Canada…and what an election! The longest federal election campaign in Canadian history (78 days) and an unexpected landslide victory for the Liberals led by Justin Trudeau. Alberta. This means that late voters in the province of British Columbia which is an hour behind Alberta knew the result before they even caste their vote! 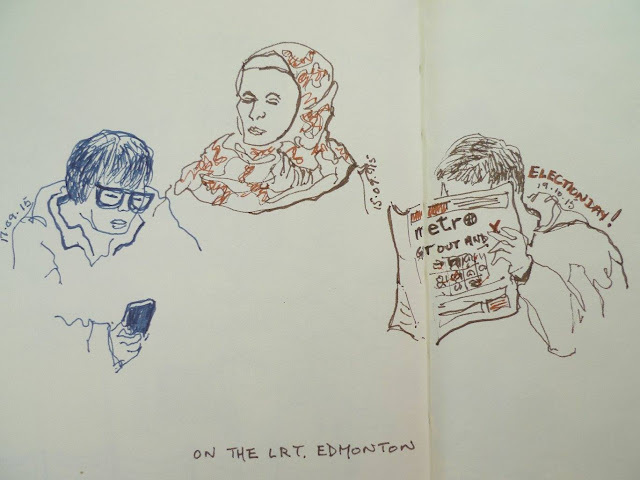 I love sketching people on the train and on 19th October was able to add a sketch of a person reading the Metro (a freebie paper) with the headline “Get Out and X”. A little memento of a big day in Canadian history. Pitt pens in Global Handbook Journal (5.5"x5.5").